Special events across iconic London locations earlier this month marked the world premiere of the new Jaguar XE, the brand’s new sports saloon. With live performances and exhilarating stunts on the River Thames and at Earls Court, Jaguar celebrated British creativity and innovation as part of the dramatic unveiling of the Jaguar XE. Jaguar has been working with multi-platinum, British singer songwriter Emeli Sandé to create a FEEL XE track which has been inspired by the public through social media. Fans were asked “What makes you feel Exhilarated?” using #FEELXE. Emeli then premiered the new track, ‘Feels Like’, live on the Thames as part of an exclusive 45-minute set on a floating stage positioned in the middle of the river with the London Eye and County Hall as a backdrop. Jaguar began its celebrations earlier in the night with a star-studded event narrated by actor John Hannah at Earls Court, the home of 14 Jaguar debuts since 1935. An audience of over 3,000 VIP guests were in attendance, including Stella McCartney, David Gandy, José Mourinho, Jodie Kidd, Brian Johnson, Sam Riley, Gary Lineker, Ruben Cortada, Example and Sienna Guillory. The show included performances by Emeli Sandé, The Kaiser Chiefs, the Royal Ballet and members of the London Philharmonic Orchestra. Each performance brought to life significant moments in the history of Jaguar, from the launch of the SS100 in 1935 to the global success of the current Jaguar line-up. 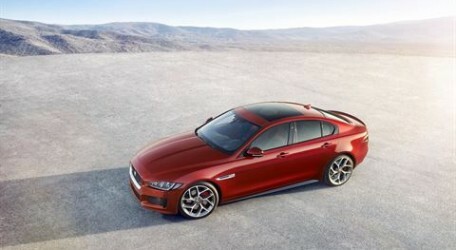 The show culminated in a spectacular reveal of the Jaguar XE, showing its dramatic journey from the new XE state-of-the-art Manufacturing facility in Solihull, UK to Earls Court.